1) What are the three divisions of the NYC subway system and what do they stand for? The three divisions of the NYC subway system are the IRT (Interboro Rapid Transit), the BMT (Brooklyn, Manhattan Transit), and the IND (Independent). 2) What trains go to what divisions now-a-days? The , , , , , , , and (42nd street shuttle) are part of the IRT division, the , , , , , , , and (Franklyn Ave shuttle) are part of the BMT division. The , , , , , , , and (Rockaway shuttle) are part of the IND division. 3) Was the IRT the first to designate numbers to their trains? No, it was the BMT, originally known as the BRT (Brooklyn Rapid Transit) The BMT labeled their trains 1 to 16 from 1924 until 1967. 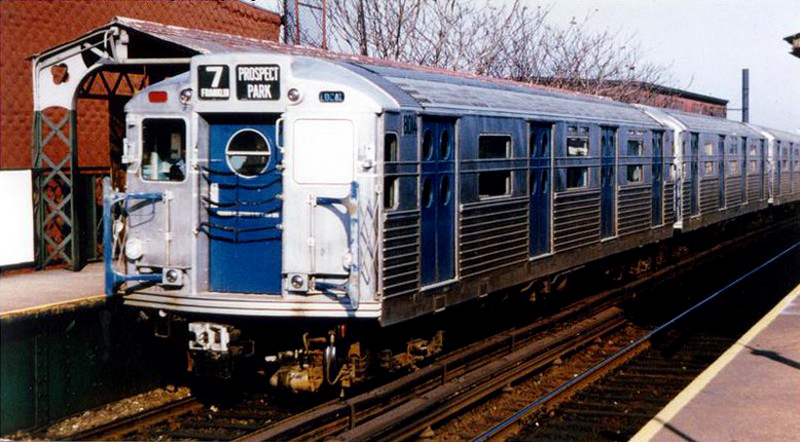 There was also an unofficial BMT #17 train linking the Fulton street el with the Manhattan side of the Canarsie line. Most of the numbers were eliminated as els were being demolished, lines got phased out, or some lines merged with others. The existing lines eventually became part of the letter system very gradually. 4) How did the use of letters come into play for the BMT? Probably because the IND company designated their trains from A to H, so the BMT picked up with J to Z as they started getting absorbed into the IND network of tracks. Additionally, the BMT couldn't use numbers anymore because the BMT was starting to overlap with the IRT. For example, the IRT train in Flushing would be confused with the BMT #7 train on the Franklyn Ave shuttle. Therefore, the BMT uses letters since it shares trackage with some IND lines and the IRT uses numbers. 5) Why did the BRT become the BMT? The BRT went bankrupt as a result of a motorman's mistake on the Franklyn Ave shuttle . Back in 1918, the shuttle was the thru service between the Brighton line and Fulton st el. The motorman was placed on this line due to a subway strike and unfortunately was unfamiliar with this route. He drove the train so fast down a curve that the wooden subway cars got smashed up killing 98 people. 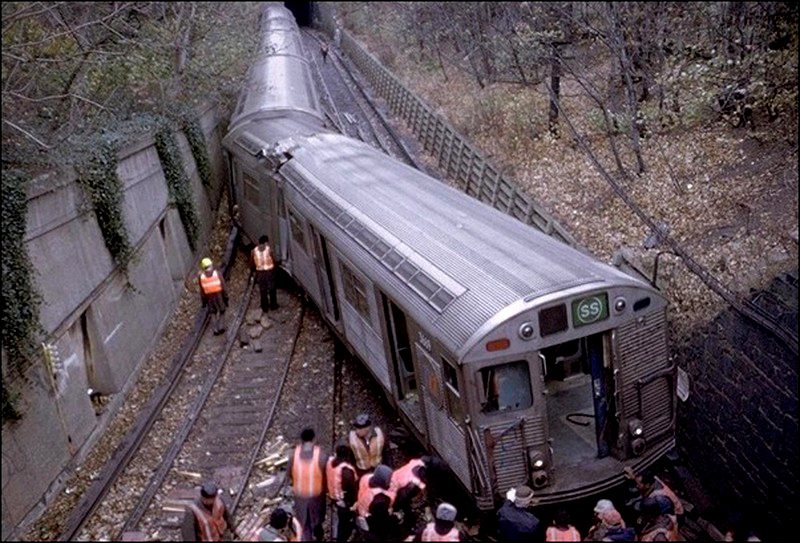 This was the worst subway accident in history known as the Malborne st wreck. This happened on November 1, 1918. As a result to all of this, Malborne st was changed to Empire Blvd to try to erase a bad memory. In addition, the BRT went bankrupt and was reorganized as the BMT. Wooden cars were never allowed to be used again, particularly in the subways and shortly after the disaster, the Brighton line was severed from the Fulton st el and the remaining stub of the Brighton line became the Franklyn Ave shuttle. Some 50 to 60 years later, the train jumped the track in the same very location as that disaster! 6) What did QB, QT, and TT really stand for? 7) What was the first monorail system in the world? The first monorail system in the world was the Boynton Bicycle Railroad invented by Eben M Boynton back in 1852. He ran an exhibition of the Bicycle Railroad in 1890 on the abandoned tracks of the Sea Beach and Brighton Beach Railway (leased from the New York and Sea Beach Railroad Company) from Gravesend to Coney Island in Brooklyn. It was a steam powered locomotive running with one immense driving wheel eight feet in diameter, on a single rail, and kept in an upright position by wheels running on each side of a guide rail above. Although Boynton's invention fascinated many scientists and engineers of his day, he was never able to garner enough backing to expand beyond his small demonstration line in Brooklyn from Boynton Place to Surf Ave / Ocean Parkway via West third street. 8) What were the four subway services using the Nassau street loop? 9)What services did these Nassau street loop lines evolve into throughout the years? 10) What were the four original steam powered els in Manhattan? 11) Explain the routes of these Manhattan els? The Third Ave el went all the way to Bronx Park by 1901 as a steam powered el. 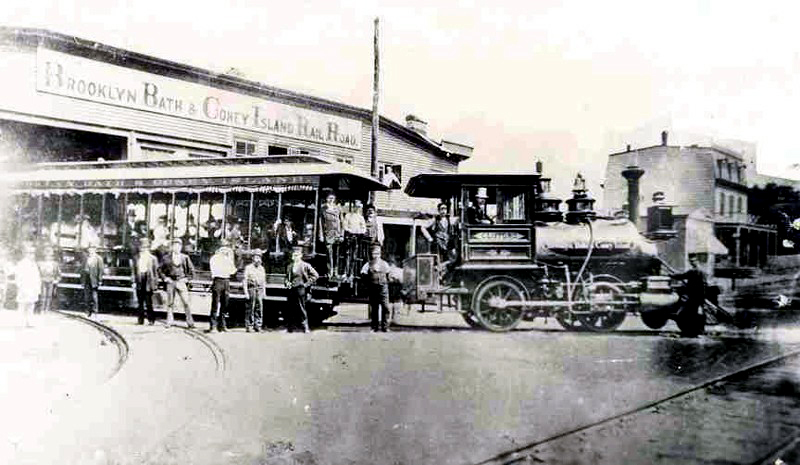 It was electrified April 1, 1903, leased to the IRT and further extended four more stops in 1917 to join the White Plains Road el at a double decker station, Gun Hill Road (today's and trains). 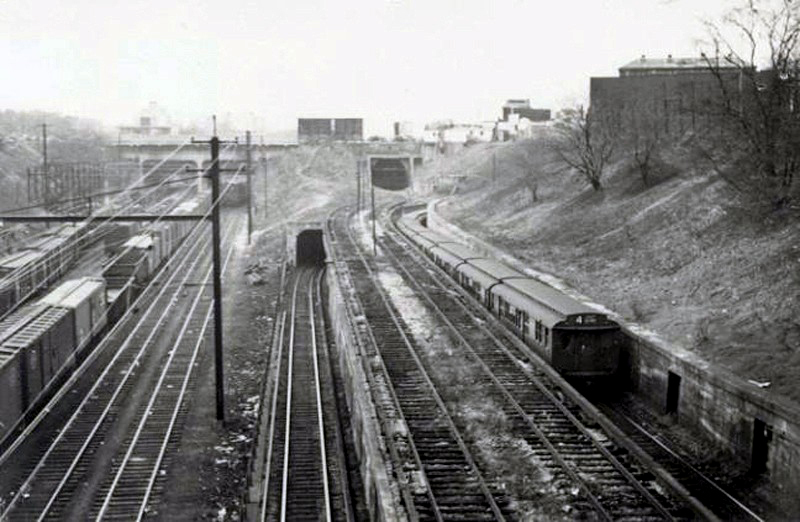 The Third Ave el was on the lower level, known as the train 1967 - 1973, (lower level of Gun Hill Road station still exists but abandoned). The Second Ave el electrified in 1903, was leased to the IRT, and extended into the Southern Blvd and Westchester Ave els in 1917 (today's and trains) in the Bronx. It additionally crossed the Queensboro bridge to today's Queensboro Plaza, a double decker train station. North of there, it continued onto the Astoria el in 1917 (today's and trains) and Flushing el in 1916 (today's train). The Sixth and Ninth Ave els were electrified in 1903, leased to the IRT, and extended into the Jerome Ave el in 1918 (today's train) in the Bronx. The extension was known as the Sedgewick connection and STILL exists today. This section of track became known as the Polo Grounds shuttle until it phased out in 1958. 12) What were the seven predecessor steam powered els in northern Brooklyn? 13) Which elevated train station is nearest to all three divisions of the NYC subway system? Queensboro Plaza station is nearest to all three divisions simultaneously. The IRT line and the BMT and trains are on the double decker elevated structure. Directly below the el is the IND division's , , , and trains with their own separate train station called Queens Plaza. When the IRT, BMT, and IND were separate competing companies, the IND was supposed to have rendered the el obsolete, but instead they co-exist! 14) When were parts of the Jamaica el torn down and why? Parts of the Jamaica el and were torn down during the 1980s prior to its present connection to Archer Ave and Jamaica Center. The connection was begun in 1969 but finally opened in 1989. The elevated structure beyond 121th street was abandoned because business owners didn't want it there anymore. Ironically enough, they lost a lot of business when the el was gone. 15) Where did the M train go throughout the years? 16) When was the train on Sixth Ave and why? 17) Explain the and switch between the Astoria el and Queens Blvd subway? 18) When was the IRT built? 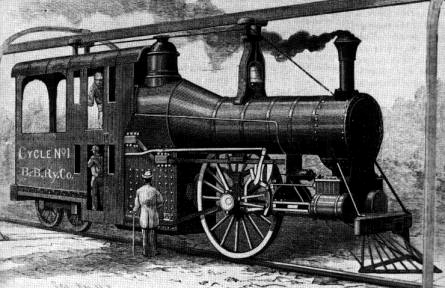 19) What were the eight original steam powered surface railroads in southern Brooklyn? 20) Out of all the eight original steam powered surface railroads in southern Brooklyn, which three became els later on? 21) Out of all the eight original steam railroads in southern Brooklyn, which three went underground as kind of a subway? 22) Out of all the eight original steam powered surface railroads in southern Brooklyn, which four had short lives and never became part of today's subway system? 23) What was the last running trolly service in Brooklyn and the whole entire city? The McDonald Ave trolly was the last running line from 1916 - 10/31/1956. These tracks were the original Prospect Park and Coney Island Railroad tracks 1875 - 1916 and shared by the LIRR from 1885 - 1899 to eastern Long Island. The tracks were also used to deliver new subway equipment to the Ave X subway shop until the 1980s but the right of way has been used for vehicular traffic since the 1960s. The original tracks are STILL under the asphalt. 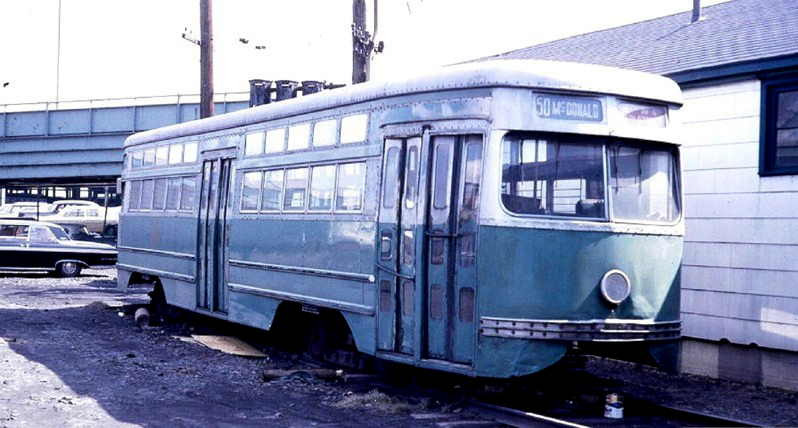 24) Will trolly cars be making a comeback to Brooklyn? Hopefully so! As a train enthusiast I'd personally like to see it happen. But of course, politics always makes things happen many decades later or not at all. Below is a proposed map of what they would like to re-create using existing trolly tracks from more than 100 years ago as well as adding new tracks on avenues that 'never' had trolly service. As you can see from the map, the trolly lines mostly go in an east - west direction crossing the existing subway and el services which go mostly north -south. Additionally, all trolly stops will be directly near the existing subway and el stops so passengers could continue their journeys to other parts of the city. 25) Is it true the MTA took away the train and merged it with the ? It was a possibility of happening as early as 2009. In 2010, the MTA discovered it was confronting a financial crisis; many of the same service cuts threatened just months earlier during a previous budget crisis were revisited, including the ending of rush-hour service. One of the newest proposals was merging the with the and creating a new line. As of 3/19/2010, it was decided from public outcry they want to keep the letter M because it's been used for 50 years. As a result, the brown was changed to an orange ! 26) How do the two lines connect? 27) What's the benefit of this? The MTA determined this move would actually benefit riders. Approximately 17,000 weekday riders use the to reach its stations in lower Manhattan, whereas 22,000 weekday riders transfer from the to other lines to reach destinations in midtown Manhattan. This proposal would also benefit and riders because with the merger of the and the , the wouldn't have to be removed as part of the service cuts, ending skip-stop service along the BMT Jamaica Line and turning the fully local. Finally, this merger would open up new travel options for northern Brooklyn and Queens , , and riders allowing direct and more convenient access to areas that are not currently served by those routes, such as midtown Manhattan. Also, this service change would give the train the title of being the only non-shuttle route to have both of its terminals in the same borough, Queens. 28) When did the LIRR ever go through southern Brooklyn to Coney Island? The LIRR used the Prospect Park and Coney Island Railroad tracks on McDonald Ave from 1885 - 1899 to bring Long Islanders to Coney Island. It also used the Manhattan Beach Railroad along today's East 17th street from 1878 - 1905, later along todays Brighton line from 1905 until 5/14/1924. These lines were part of the Manhattan Beach Division of the LIRR. 29) When did the LIRR ever go to the Rockaways in Queens? 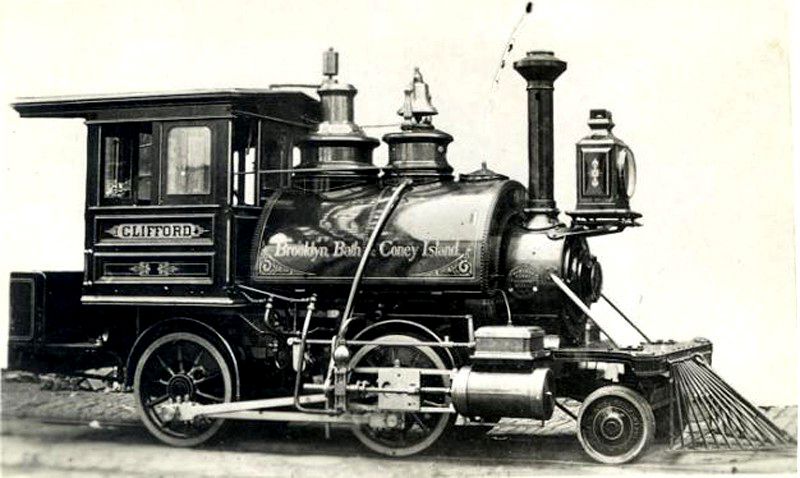 The Rockaway branch of todays train was part of the Long Island Railroad's, "Brooklyn and Rockaway Beach Railroad", 1865 - 1956. 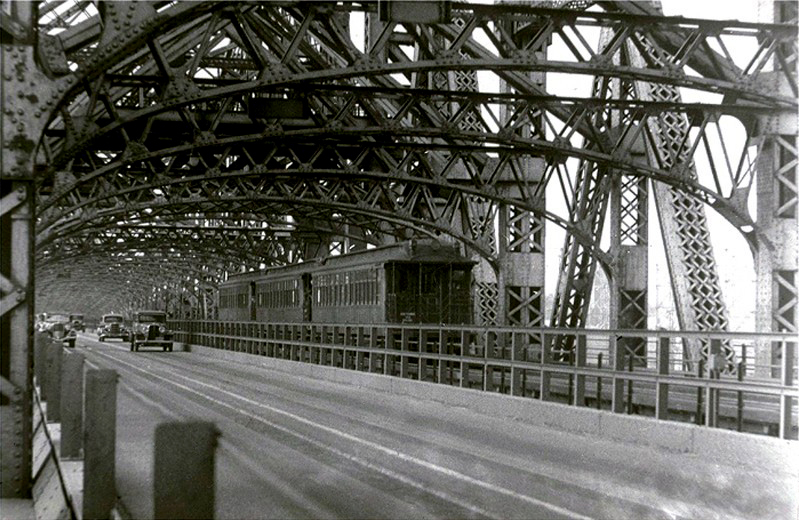 From 1913 - 1916, the LIRR had a very brief service from Chambers street on the and trains, over the Williamsburg bridge to the Broadway, Jamaica and Fulton el (BMT #13) to the Rockaways as well. As of 1956, the train from the Eighth Ave subway connects to the Rockaways since the LIRR sold the tracks to the NYC subway system. 30) Before Penn Station was built, how did the LIRR get to Manhattan? In the mid 1890s, the LIRR entered the el structure near Flatbush Ave terminal, Brooklyn, rode the el above Hudson Ave, switched onto the Myrtle Ave el (part of the former train) and terminated at Sands Street. From Sands, passengers transferred to the New York and Brooklyn Bridge Railway, crossed the Brooklyn Bridge one stop until it reached Park Row in Manhattan since 1940. 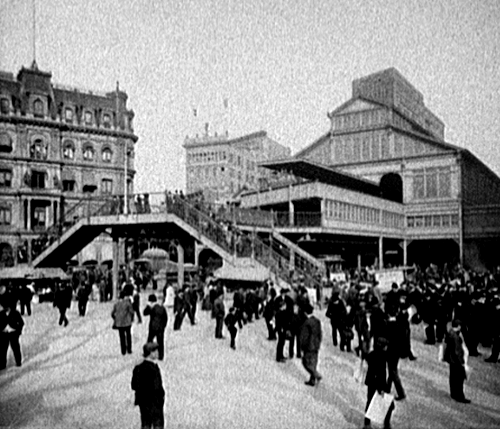 From there, they were able to switch once again to the IRT City Hall Terminal of the Third Ave el from 1882 - 1953 to the rest of Manhattan and the Bronx. If that wasn't enough, passengers were able to switch 'even' again since 1904 to the current IRT subway , , trains for further travels to Grand Central station, northern Manhattan, the Bronx, and Brooklyn going southeast. Additionally, the BMT Chambers street subway station opened in 1913 allowing access to northern Brooklyn and Queens using the , former , and which is in close proximity to all this. Penn Station finally opened in 1911 for the current LIRR route. 31) Was the LIRR supposed to have gone to Grand Central back in 1885? An East River tunnel was built 2/25/1885 to serve the LIRR into Grand Central but it never happened. The tunnel remained unfinished until 1902 and was later called the Steinway tunnel since it was close to the Steinway piano factory in Queens. On 4/3/1913, the tunnel was purchased from the city and placed under IRT operations for todays train instead. 32) Here is some video footage of Grand Central Station in today's times? 33) Will the LIRR ever go to Grand Central? Yes it will. Although it didn't work out with the Steinway tunnel back in 1885, plans are currently being made to use a different tunnel to Grand Central. In 1969, a double decker tunnel was built under 63rd street. The upper tunnel brings the train to Roosevelt Island and into Queens. This connection FINALLY opened in 1989. As it turns out, the lower level remains unused to this day; but alas, this unused portion of the 63rd street tunnel will become the new LIRR connection to Grand Central Station after 2017. 34) What train is this riding above the other train? 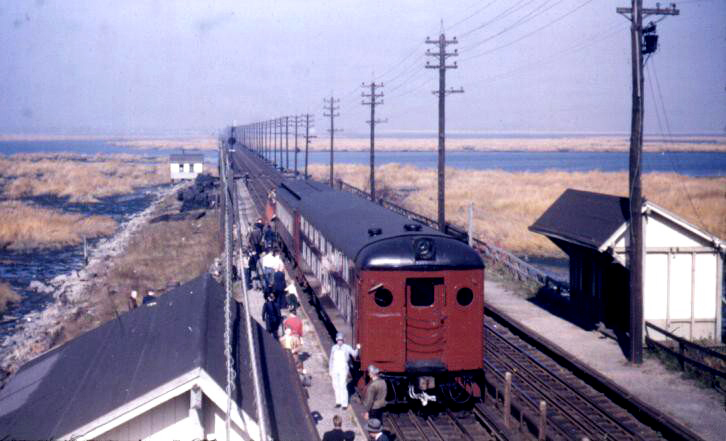 This is the IRT New Lots Ave train zooming on by over the Canarsie line back in the 1950s. This is the Livonia Ave stop on the train in East New York, Brooklyn. 35) Where did the EE train go? The went from Whitehall street to 71st and Continental Ave from 1967 - 1976 when it was phased out in favor of an extended service to 71st and Continental which later became part of today's train. 36) Was the EE train a BMT line or IND? 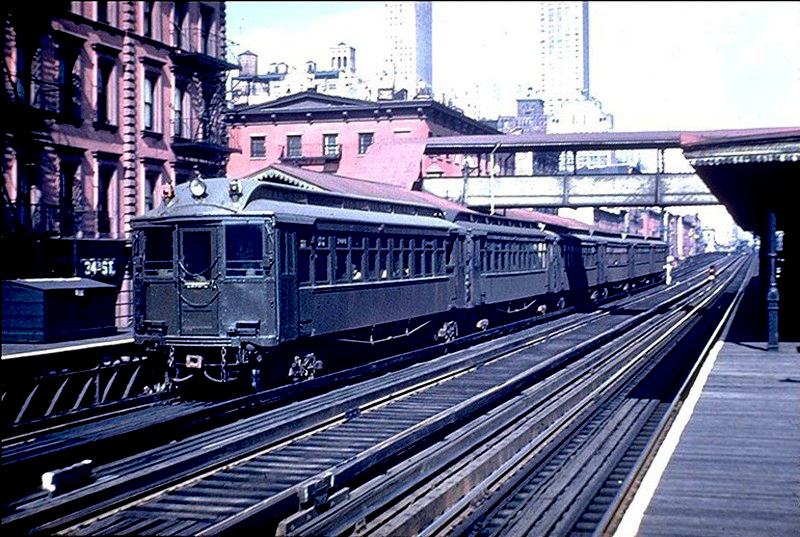 The original EE train from 4/24/1937 - 7/1/1937 was purely an IND line between the Eighth Ave and Queens Blvd subways. 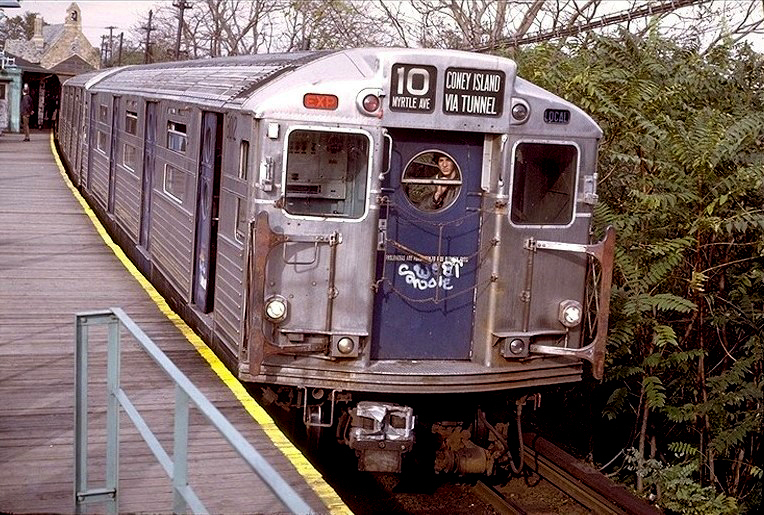 The train from 1967 - 1976 was a combination of the BMT Broadway subway and IND Queens Blvd subway. 37) Was the V train a BMT line or an IND? The train was an IND line despite BMT letters running from J to Z. The train was merged with the train. It became a combination IND Queens Blvd and Sixth Ave subways merged with the BMT Broadway el and Myrtle Ave els. It is NOW known as an orange . 38) Which line got subdivided into two separate lines? It was the Brighton line that got subdivided from four other train stations which in themselves became the Franklyn Ave shuttle . 39) Why did the Brighton line subdivide? Originally, the Brighton line was connected to the Fulton street el with access to Manhattan via the Brooklyn Bridge. After the Malborne st disaster on November 1, 1918, the Brighton line was severed from the Fulton st el, discontinuing access into Manhattan. A newer connection was implemented for the Brighton using the Fourth Ave subway to the Montegue tunnel and Manhattan bridge to Broadway and later Sixth Ave subways. In addition, the four remaining stations leading towards the Fulton st el became the Franklyn Ave shuttle of today. 40) Did the Culver el have stations beyond Ditmas Ave as an el? Yes it did. In fact, parts of where the el was chopped off can still be seen today. The two stations we lost were 13th Ave and Ft Hamilton Parkway. They used to connect the Culver with both the Fifth Ave el (BMT #5b train) and the Fourth Ave subway (BMT #5a train) at 9th Ave on the West End line train. 41) If the Culver el wasn't demolished north of Ditmas Ave, what could have been the possibilities? If the el kept going beyond Ditmas Ave, it would have had access to the Fourth Ave subway's , , and trains. In addition, rather than have the train terminate at Delancy street, it could have gone all the way to Coney Island via the Culver route while co-existing with today's train and even an extended train south of Smith 9th street. While only two stations were demolished on the Culver line, no-one realized what we REALLY lost; EASIER CONNECTIONS! 42) If the IND didn't interfere and all the Manhattan and Brooklyn els were still around, what could have been the possibilities? 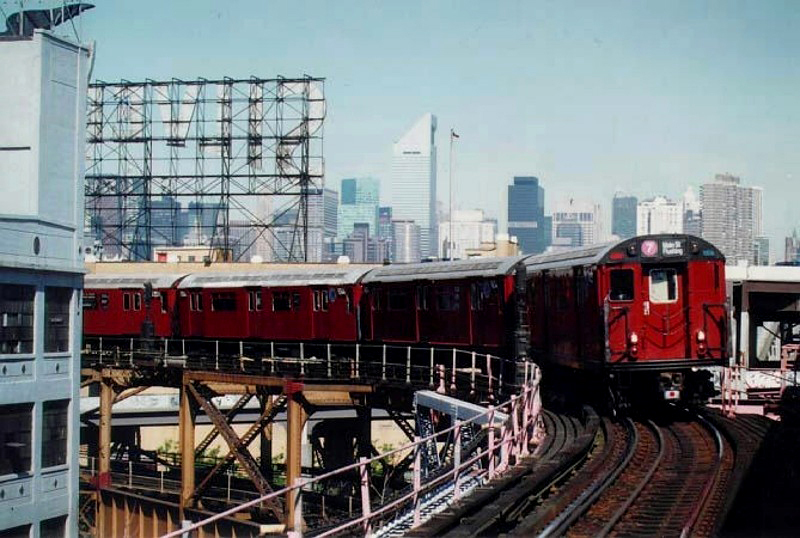 Maybe many of the Brooklyn els would still be crossing the Brooklyn Bridge like they used to and connecting with the Second, Third, Sixth, and Ninth Ave els on the way to the Bronx. 43) Where is this vintage scene? This is a street under the Brooklyn Bridge terminal in 1899. A year earlier from this photo, Brooklyn became one of the five boros of the city; it used to be a separate city from Manhattan. Notice the boy trying to sneak a ride on the trolly while the cop isn't looking. Check out that keystone cop uniform and the cobble stone streets! 44) Where was Union Depot? 45) What ever happened to Union Depot? 46) What were the shortest lived lines on the BMT system? They were the , , and trains lasting only a few months from 1967 - 1968. 47) Which BMT lines started using letters first? They were the Brighton line, Fourth Ave subway, West End line, and the Sea Beach line formerly known as the BMT #1, #2, #3, and #4 trains respectively. Later, they were known as the , RR, , and . Later, known as the , , QB, RR, , and . Later again, known as the , , , , and . Today, they are the , , , , and trains respectively. 48) Which predecessor steam powered el was one of the only lines to switch over from numbers to letters and be abandoned only a few years later? It was the Myrtle Ave el. 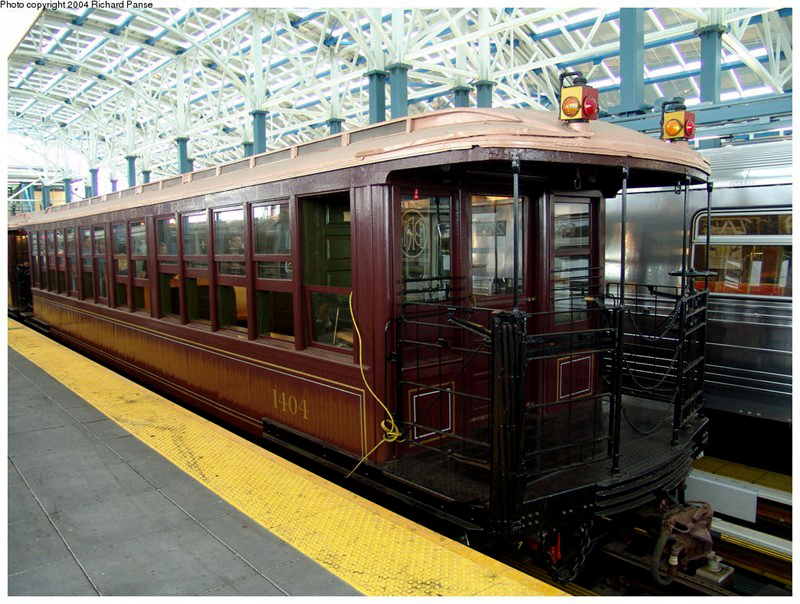 Originally a steam railroad in its early beginnings, it was electrified and called the BMT #11 train from 1924 until 1966, later to be called the train. Later, portions of the el were abandoned 10/4/1969. (Part of el STILL exists for structural integrety). The current stations between Metropolitan Ave and Myrtle Ave (Broadway) remained as the BMT #10 train, now part of today's line. 49) Which predecessor steam powered els never made it to letter status because they were demolished? The Fifth Ave el BMT #6 train was abandoned June 1, 1940. Third Ave el portion is part of the Gowanus Expressway since the 1940s. The Lexington Ave el BMT #12 train was abandoned October 13, 1950. 50) What line did the QJ become? It became today's train when it was cutback from the Brighton line. The QJ used to go from 168st on the Jamaica el all the way to Coney Island via the Brighton line. 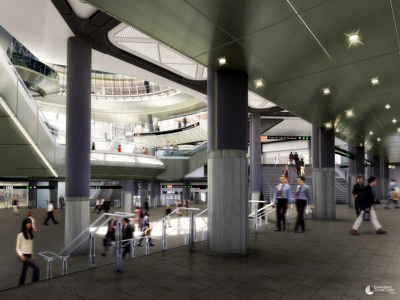 Now it goes from its new terminal at Jamaica Center to Delancy street. 51) What proof is there of the elevated trains crossing the Brooklyn Bridge? Here is some film footage of the els crossing the Brooklyn Bridge in 1899. Too bad this service ended. It would have been another way for trains to cross between Brooklyn and Manhattan besides the Manhattan and Williamsburg Bridges! 52) Which predecessor steam powered els switched from numbers to letters and still exist? 53) What part of Manhattan is this? This is a view of the just completed Ninth Ave el along Columbus Ave and West 84th street in 1879. While lower Manhattan was VERY built up with tenements in Greenwich Village, upper Manhattan still had farms and a sprinkle of shacks here and there. However, the Ninth Ave el made people move from the crowded village to northern Manhattan and eventually the Bronx, thus contributing to the area's development as a city. Upper Manhattan never looked so rustic! 54) When will the Second Ave subway ever be built? At the rate they're going, not until after today's 30 year olds are old and gray. As of 4/12/2007, there was a ground-breaking ceremony. Word is out that a partial Second Ave subway is on its way. It'll go from 96th street / Second Ave to 63rd street / Second Ave. This project was planned since the 1930s but construction didn't really happen until the 1970s and FINALLY again in the Spring of 2006! My girlfriend's brother-in-law was actually one of the tunnel diggers. It FINALLY opened on 1/1/2017. The will is the extension of Broadway service beyond 57th street into this new line. After 2025, a full length subway called the train will continue from 63rd to Lower East side / Second Ave linking itself with the train to Brooklyn. North of 96th street could be a continuation of the line to 125th street / Second Ave. A connection to the Bronx via the Pelham Bay elevated train was sometimes discussed but we'll have to wait and see. 55) When was Stillwell Ave train station open for business once again? It opened for business in the Summer of 2004 with the , , and trains. The train returned to Stillwell by 2005. Additionally, the train goes from 168st to Brighton Beach and the train was cutback from Brooklyn on 2/22/2004 and went from Whitehall to Ditmars. The remained only in Queens and Manhattan until its last day, 6/25/2010; and 'not' surprisingly came back again on 11/7/2016 from Whitehall to Ditmars Blvd since the is now needed for the new Second Ave subway. 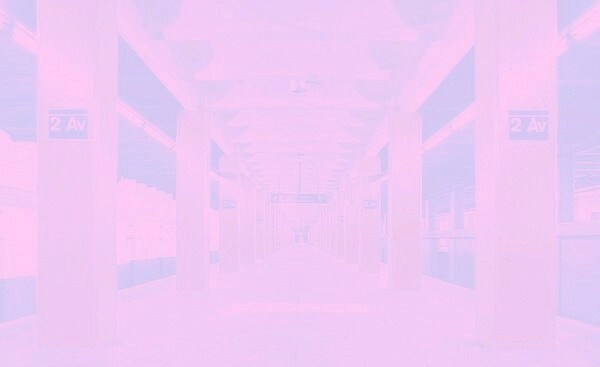 57) What elevated train station is this? This is the Gun Hill station in the Bronx. The upper level is the current IRT and trains. The lower level which doesn't exist anymore was the last remnant of the Third Ave el IRT train. It was phased out in 1973. 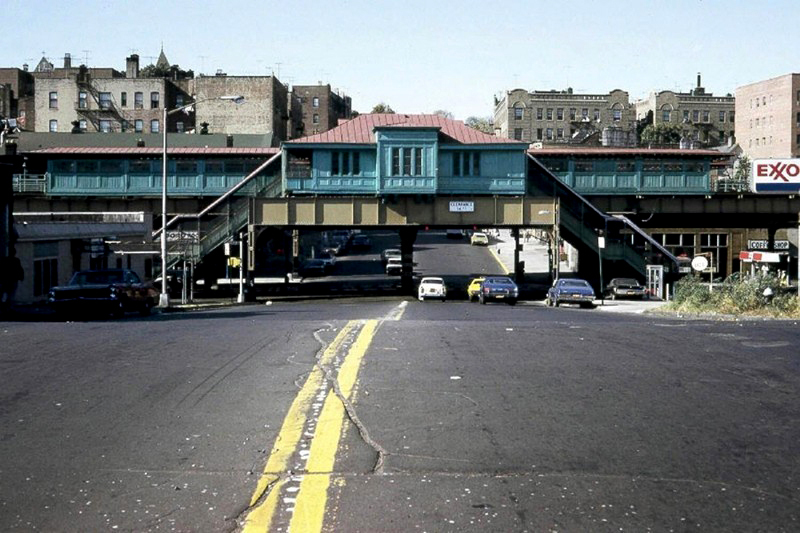 If this elevated line was still here in the Bronx, it could have been a great connection to the new Second Ave subway. 58) What line does this belong to? This was more of the Third Ave el IRT train in the Bronx. Many of the stations looked like this throughout Manhattan also before demolition. 59) Which predecessor steam powered el was the only line to switch over from steam to electric, be named an IRT number and be abandoned only a few years later? It was the remnant of the Third Ave el el. Originally a steam railroad in its early beginnings, it was electrified in 1903. 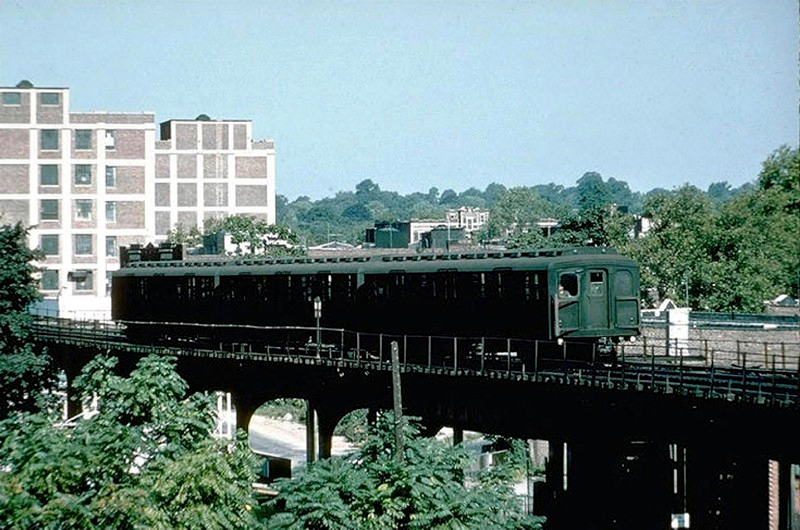 From 1955 to 1967, the Bronx portion of the el was the only remnant left from most of the abandoned el in Manhattan. In 1967, it was renamed the IRT until it finally ended in 1973. 60) What was the longest running double letter line? The line was the longest running double letter line lasting 54 years 1932 - 1986. 61) Which line is the only service in the entire system that doesn't go to Manhattan? The train is the only line that never goes to Manhattan. 62) Where the heck is this? Believe it or not, this was the Culver line when it started out as a steam railroad from 1875 to 1916. When they built the current el along McDonald Ave in addition to Thirty-seventh street, the original railroad in the picture became a trolley service, route #50, from 1916 - 1956. As of 1985, the trolley tracks and parts of the Culver el were demolished from Ditmas Ave to Ninth Ave on the West End el line. 63) What station is this not being used anymore? This is the same location as the above picture almost seventy five years later in 1985. 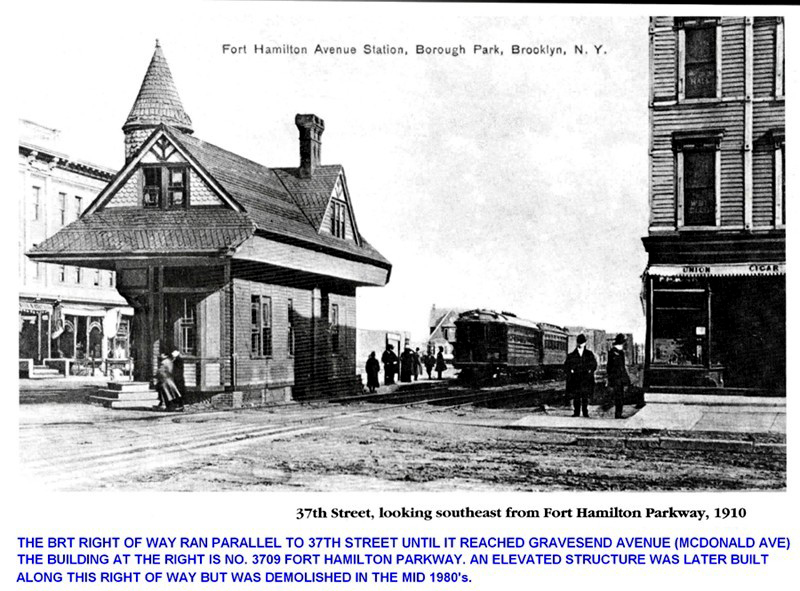 This was the Ft Hamilton Parkway station that was northwest of Ditmas Ave on the train. 64) Where is this location? This was part of the Culver el that was demolished in 1985. Notice only one track is being used in either direction since its only job was to go back and forth between Ditmas Ave on the line to Ninth Ave's train. In it's heyday, it was the section of elevated track that connected the Culver line with the Fifth Ave el in 1900 called the BMT #5b train. It also connected with the Fourth Ave subway later on in 1931 called the BMT #5a train. 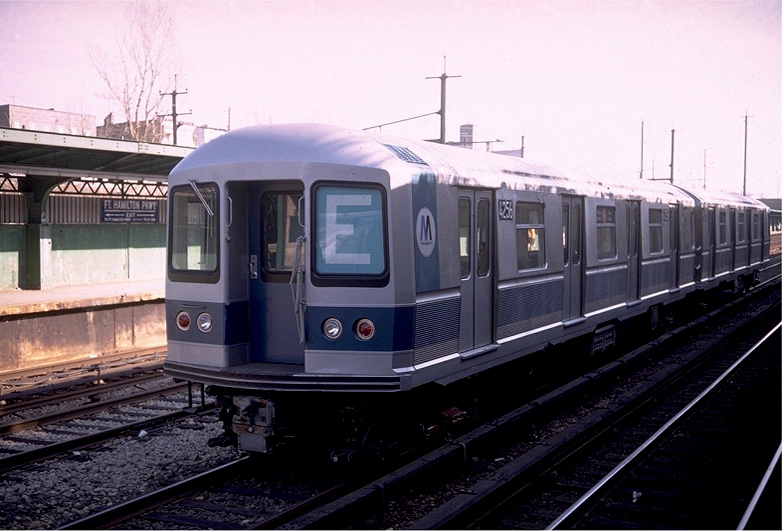 From 1959 - 1967, it was reduced to a shuttle and called the BMT #5 train. In its last years 1967 to 1975, it was known as the SS or Culver shuttle. Notice the original Prospect Park and Coney Island Railroad below the el since 1875. 65) What's all that funny paint on this subway car? 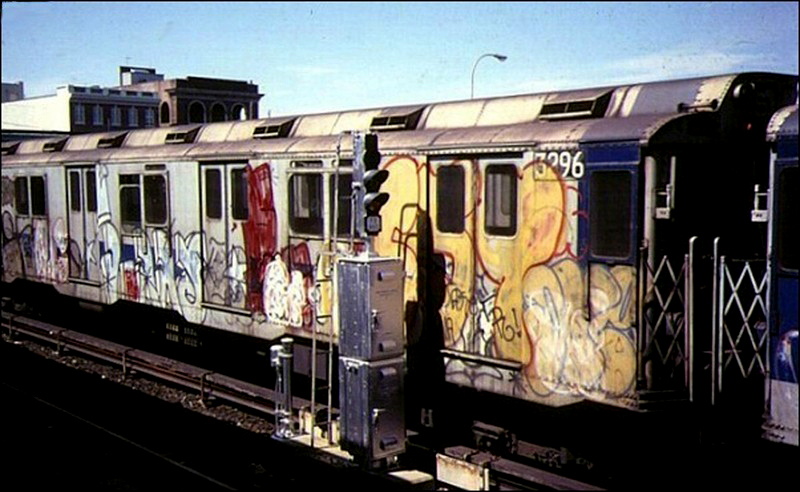 From the early 1970s up until 1984, practically every subway car was covered with grafitti. It was a cultural phenomenon which was both good and bad at that time, but mostly bad! Today, you don't see things like this anymore. 66) Which lines today are pure IND lines? The , , , and (Rockaway shuttle). 67) Which lines today are pure BMT lines? The , , , , , (Franklyn shuttle), and . 68) Which lines today are a combination of the IND and BMT? The , , , , , and . The is IND from 207th Street, Manhattan to the tunnel portal between Grant Avenue and 80th Street / Hudson Street, Queens. 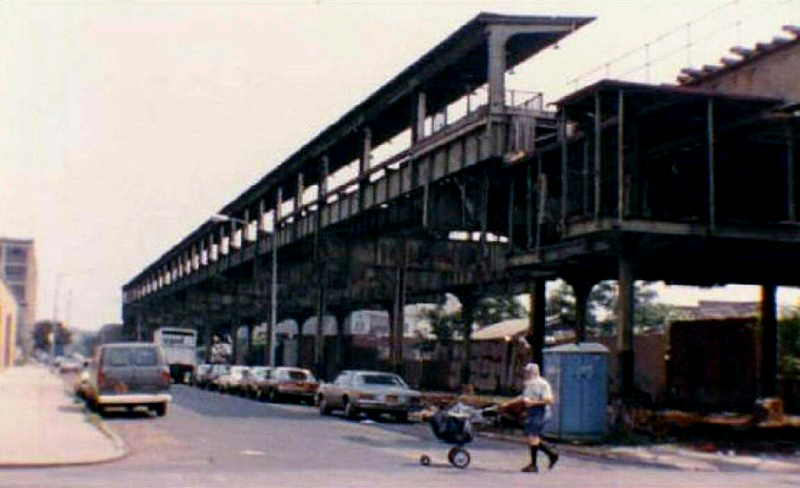 The elevated section from 80th Street / Hudson Street to Lefferts Blvd was the former BMT Fulton Street elevated line and connected to the IND in 1956. Additionally, the whole Rockaway line, which branches at Rockaway Blvd was built by the Long Island Rail Road, and also became part of the IND subway line that same year. The is IND from 205th Street, the Bronx to Broadway-Lafayette, Manhattan. The tracks are BMT from the Manhattan Bridge to Coney Island via the "Brighton line". The Chrystie Street connector (which includes Grand Street station) built by the MTA after unification opened in 1967 connecting the two portions. 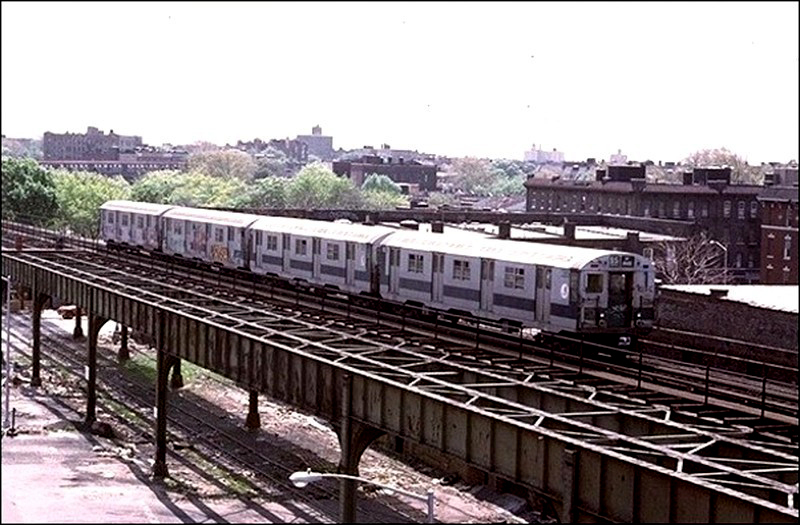 The B ran part of the day to 21st Street-Queensbridge in the 1980s, built after unification and not part of either the former IND or BMT. The is IND from 205th Street, the Bronx to Broadway-Lafayette, Manhattan. The tracks are BMT from the Manhattan Bridge to Coney Island via the "West End line". The Chrystie Street connector (which includes Grand Street station) built by the MTA after unification, opened in 1967 connecting the two portions. The is IND from 179th street, Queens to the Church Ave tunnel portal in Brooklyn. The tracks are BMT from Ditmas Ave to Coney Island. The BMT portion of the route, known as the "Culver Line", was connected to the IND line in 1954. The Culver Line formerly connected to the West End line at 9th Ave via a no-longer-existing elevated structure. 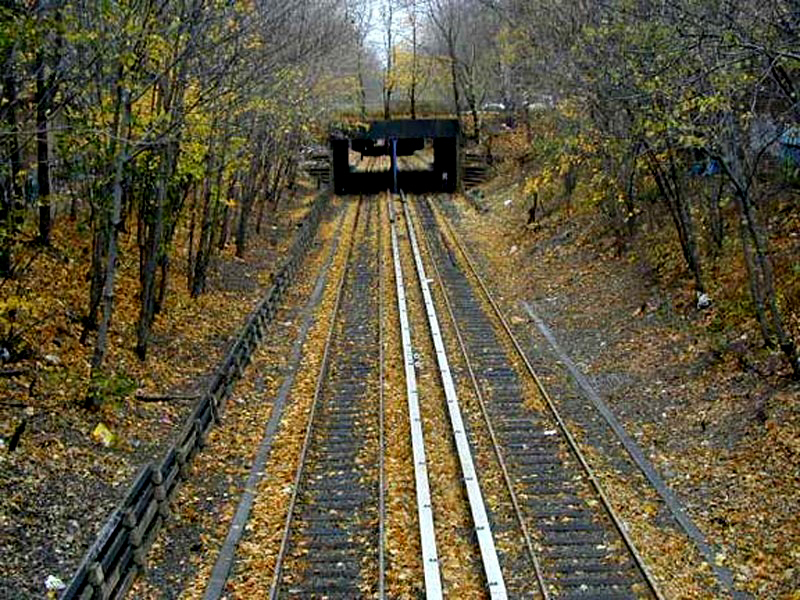 The Ditmas Avenue-9th Avenue section operated as the "Culver Shuttle" until its abandonment in 1975. The is BMT from 95th street, Bay Ridge to the 60th Street Tunnel in Queens. The "11th Street Connector", which connects the BMT tunnel to the IND Queens Boulevard line, opened in 1955 and was the second inter-divisional connection to open. The is BMT from Metropolitan Ave, Queens to Marcey Ave, Brooklyn. 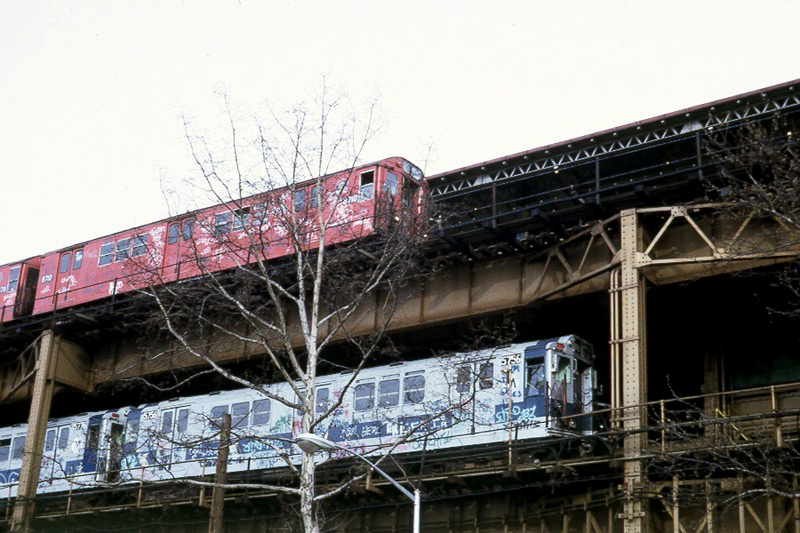 It crosses the Williamsburg Bridge to Essex street, Manhattan and switches to the IND tracks of the Chrystie street connection going along the Sixth Ave subway in Manhattan and Queens Blvd line in Queens. This part of the Chrystie Street connector, built by the MTA after unification, opened 1967 - 1976. It hasn't been used in over 30 years until FINALLY again in 2010! 69) What line was a combination of today's Jamaica el and Canarsie line? It was a steam railroad that went from East New York to Canarsie Landing Oct 21, 1865 to 1906. It was later electrified, elevated in parts and went from Broadway Ferry to Canarsie Shore July 28, 1906 to 1913. Later, it went from Canal street on the to Rockaway Pkway on the from 8/14/1913 - 11/27/1967. In 1924, this original Canarsie service was renamed the BMT #14 train. Severed track connections at Atlantic Ave phased out this service in 1967. 70) What line was a combination of today's Canarsie line and Fulton st el? It was the BMT #17 train. It went from 14st on the to Lefferts Blvd on the from 9/23/36 - 4/30/56. Severed track connections at Atlantic Ave phased out this service in 1956 in addition to the Fulton st el being mostly demolished in sections from 1936 - 1956. 71) What line was a combination of the Sixth Ave subway and Jamaica el? It was the train. There was a Chrystie street connection allowing IND trains to ride on the BMT tracks. 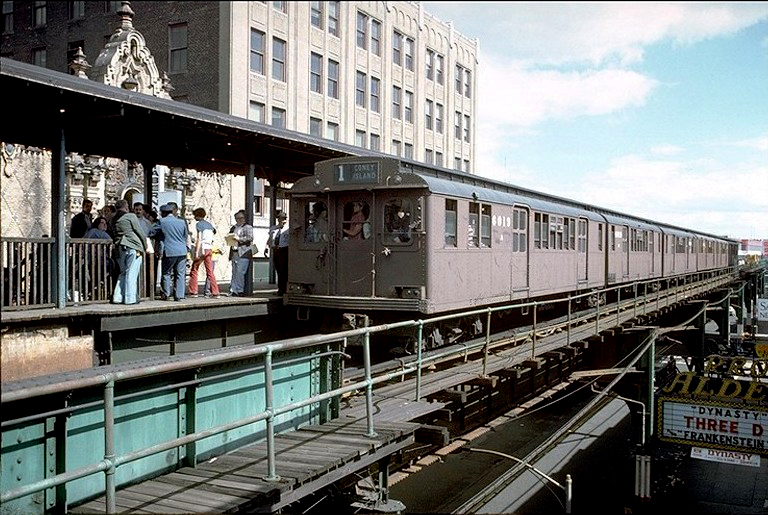 This connection occurred July 1, 1968 allowing the train to go from 57th/ Sixth to 168st Jamaica with the train. The was renamed the on 1/2/1973 and went from 57st/ Sixth to Eastern Parkway. The Jamaica el discontinued service north of Queens Blvd 6/14/1974 and the K train was phased out on 8/27/1976 because of the TA's financial troubles. The Jamaica el ceased operations from Queens Blvd to 168st on 9/10/1977. The Chrystie street track connections haven't been used in revenue service for over 30 years, but is NOW used for the orange service as of 2010. 72) What train station is this? Believe it or not, there was once a train stop called Bensonhurst station. This was the Brooklyn, Bath, and Coney Island Railroad along today's Bath and Harway Avenues 1864 - 1885. It was later called the Brooklyn, Bath, and West End Railroad 1885 - 1913. Today's West End el train took the place of this railroad in 1916. When the change occurred, these particular tracks became a trolly service from 1913 until 6/28/1947. 73) What train line is this? This is the current Sea Beach line train just approaching the 59th street tunnel to meet the Fourth Ave subway train 1913 - present. The tracks to the left of the photograph is the Manhattan Beach Railroad (Bay Ridge Branch) from 1903. These tracks were once part of the Long Island Railroad but now owned by the New York and Atlantic Railway as a freight service 1997 - present. 74) What avenue are these tracks on? This is McDonald Ave between today's Ave H and Ave I where the Prospect Park and Coney Island Railroad (Culver line ) was from 1875 to 1912. It later became a freight line from 1912 - 1980s, and a trolley service from 1916 - 1956. The other tracks going horizontally are the old Manhattan Beach Railroad tracks from 1876 - 1903. The house in the background is the old Parkville station the two railroads shared. 75) Where is this just a few years later? This is McDonald Ave again between today's Ave H and Ave I where the Prospect Park and Coney Island Railroad (Culver line ) was from 1875 - 1912. It later became a freight line from 1912 - 1980s, and a trolley service from 1916 - 1956. The other tracks going horizontally in the previous photo were torn up and placed underground between 1903 and 1918, now used by the New York and Atlantic Railway 1997 - present. 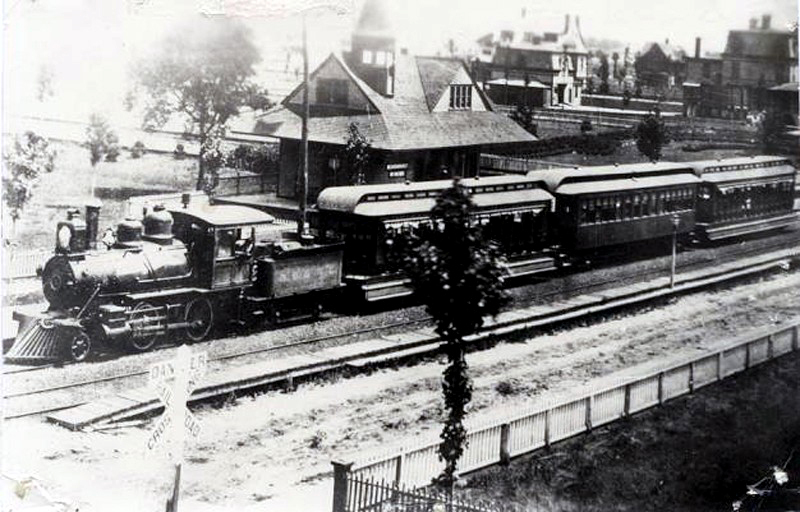 The old Parkville station was still there but used only by the Culver line after the change. In 1916, the current el was built along McDonald Ave.
76) What trains can you catch at 59th street / Columbus Circle? You can catch the , , , , and trains. 77) What trains can you catch at 42nd street / Times Square? 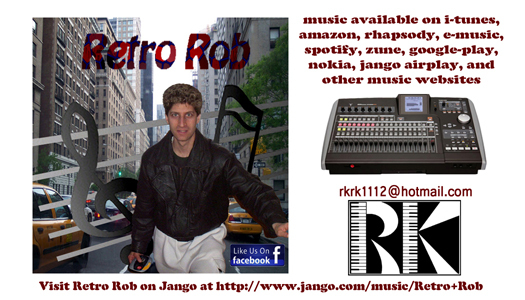 You can catch the , , , , , , , and Grand Central shuttle at this station. In addition, you can walk down a block long tunnel under 42nd street to catch the , , and trains but a little bit of a walk. 78) What trains can you catch at South Ferry - Whitehall Street? You can catch the , , and trains. Until 3/16/2009, the IRT South Ferry (1 train) was a separate station from the BMT Whitehall street station (N, R, W trains). They were merged together as part of the lower Manhattan improvements and is now known as South Ferry - Whitehall Street. Previously, South Ferry subway station (1 train) was built beneath an already existing South Ferry elevated terminal for the IRT Sixth Ave el until 12/4/1938, the Ninth Ave el until 6/1/1940, Second Ave el until 6/13/1942, and Third Ave el until 12/22/1950. 79) What trains can you catch at Jay Street - Metro Tech? You can catch the , , , , and trains. Until 2010, the IND Jay Street (A,C,F) was a separate station from the BMT Lawrence Street station (N and R). 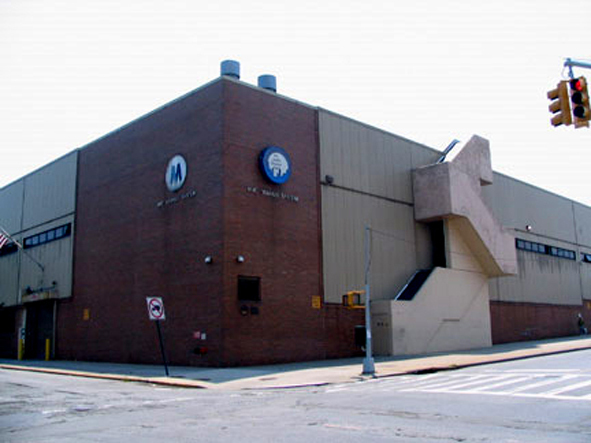 They were merged together as a way of improving a major Brooklyn subway station and is now known as Jay Street - Metro Tech. Years previously, Jay street (A,C,F) had a free transfer to the BMT Myrtle Ave el train until 10/4/1969. 80) What train station is this? 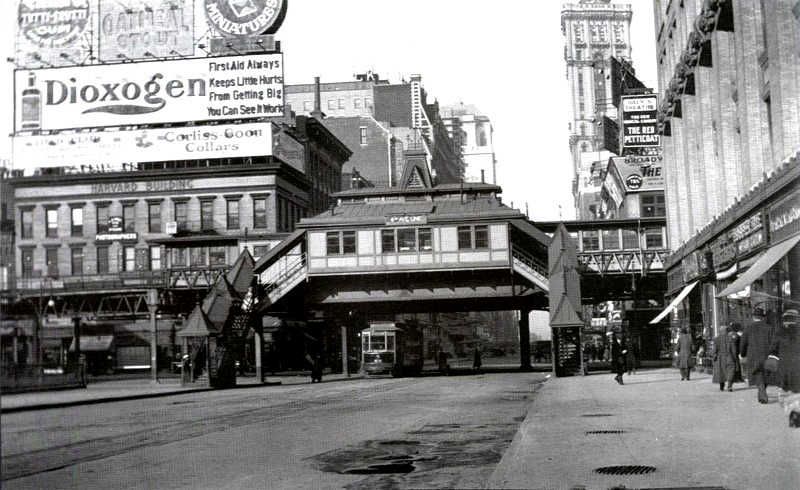 This is the Sixth Ave el at the intersection of 42nd street in the years 1872 - 1938. The Times Tower in the background was just built in 1904. Notice the 42nd street trolly too. Below 42nd street is the freshly built shuttle train which was part of the upper west side's , , and lower east side's , , trains. 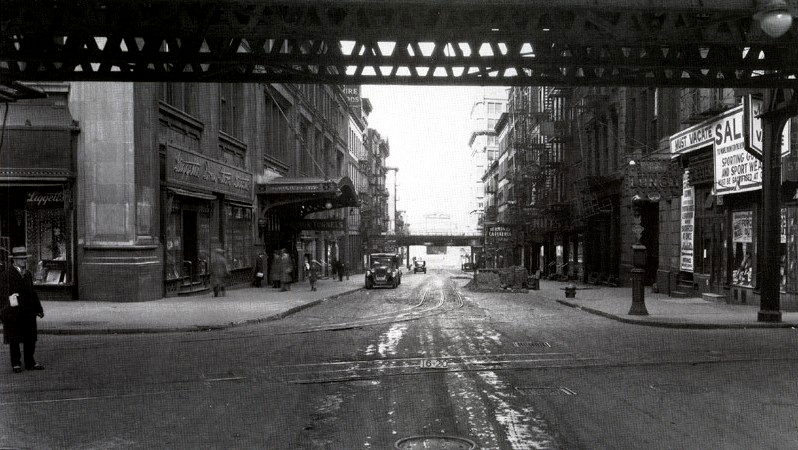 The , , , under Sixth Ave wasn't even built yet until they tore down the Sixth Ave el in 1938. The train didn't even reach Grand Central in Manhattan until 1915 and wasn't supposed to! The last stop for the was Vernon - Jackson Avenues in Queens until they finally opened up the Steinway tunnel for 'subway' use instead of the LIRR to Grand Central as originally planned in 1885. The train terminal has been Seventh Ave and 42nd street (Times Square) since 1917. Work is currently in progress to extend it to Eleventh Ave at the Jacob Javets Convention Center by 2017. In later years it could go south on Eleventh Ave and terminate at the South Street Seaport! 81) What part of Manhattan is this? This is Herald Square in the 1930s. In the background is the Sixth Ave el from 1872 until 1938. The Sixth Ave subway , , , didn't even exist yet until 1940. To the left of the elevated station is the Manhattan Mall which was once Gimbals, A & S, and Sterns. 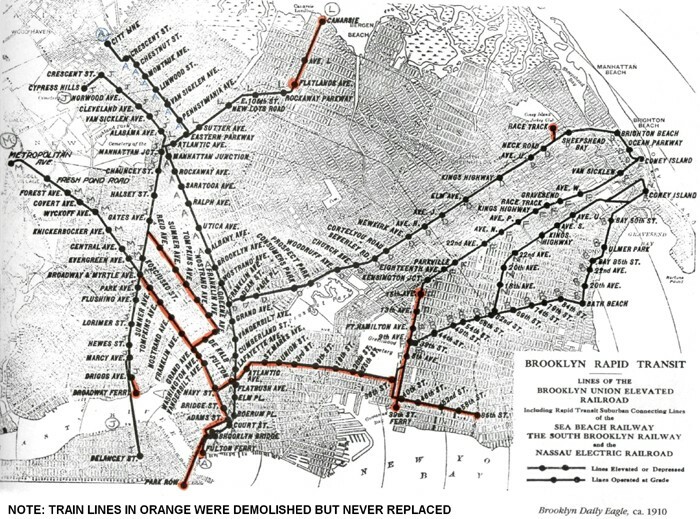 To the bottom right is today's Broadway subway , , , since 1918. This very location, W 33 St and Sixth Ave also serves as the northern terminal for the PATH train from New Jersey. 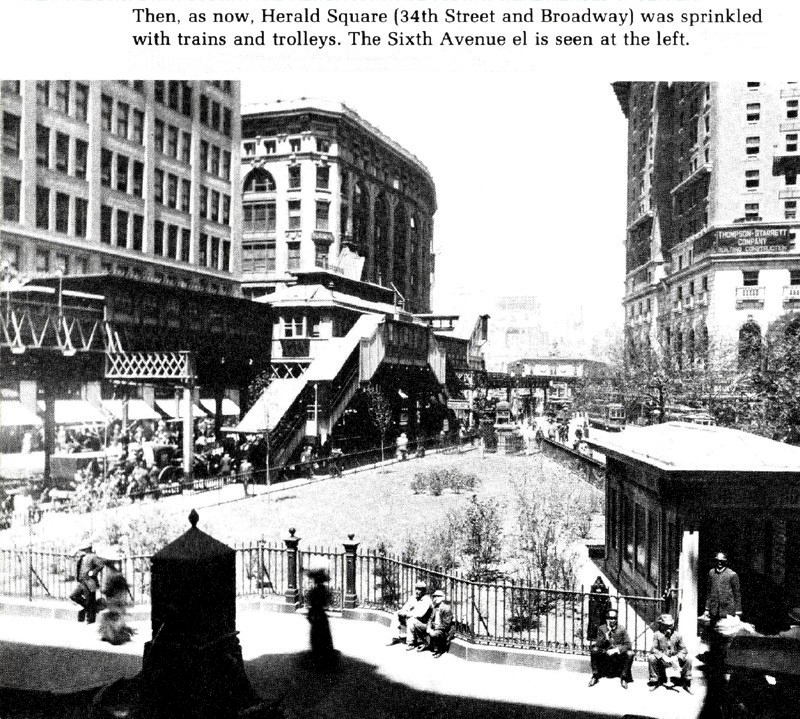 In later years, the Broadway and Sixth Ave stations became one BIG station known as 34st/Herald Square as it is today. There's even a walkway under W 33 St under the Manhattan Mall leading to Penn Station's , , , , , and LIRR but was closed in the 1980s due to the homeless problem. Maybe someday they'll re-open after 25 years and spruce it up a bit like they did for the Times Square walkway! 82) What trains can you catch at 14th street / Union Square? You can catch the , , , , , , and trains. 83) What stations is it possible to have a direct connection between the subways and the Long Island Railroad? 1) Penn Station , , , , , and trains near the LIRR in Manhattan. 2) Woodside train near the LIRR in Woodside, Queens. 3) Sutphin Blvd , , and trains near the LIRR in Jamaica, Queens. 4) Flatbush Ave , , , , , , , , and trains near the LIRR in Flatbush, Brooklyn. 84) What other stations have transfer possibilities with the Long Island Railroad? 1) Atlantic Ave train near the LIRR in East New York, Brooklyn but a little bit of a walk. 2) Main street train near the LIRR in Flushing, Queens but a little bit of a walk. 85) What station WILL have transfer possibilities with the Long Island Railroad for the first time ever? Grand Central Station will have transfers between the , , , , and Grand Central shuttle trains with the LIRR once the lower level of the 63rd street tunnel is completed after 2025. This project is sometimes referred to as the East side access. 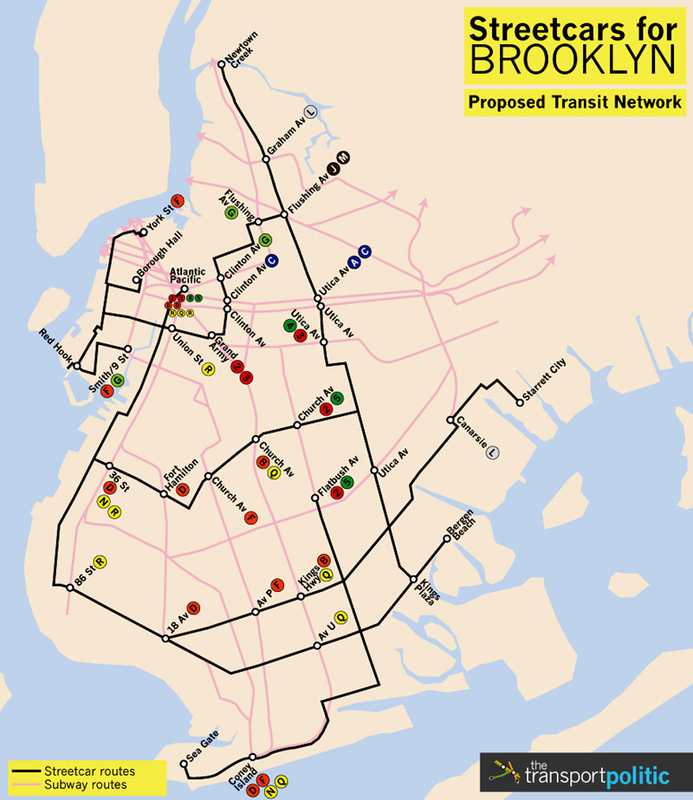 86) What major Brooklyn el connected the Brighton line and today's Franklyn Ave shuttle? It was the Fulton street el BMT #13 train in Brooklyn. This was where today's Franklyn Ave shuttle allowed the Brighton line to share this el and travel west until it continued downtown and crossed the Brooklyn Bridge 1898 - 1940. Up until 1998, part of the Fulton street el was still being used to lead passengers to the Franklyn Ave shuttle. When the shuttle was re-built in 1998, this 100 year old structure was torn down. The Fulton street el #13 also continued eastward until it reached Atlantic Ave on today's train all the way to Lefferts on today's train. 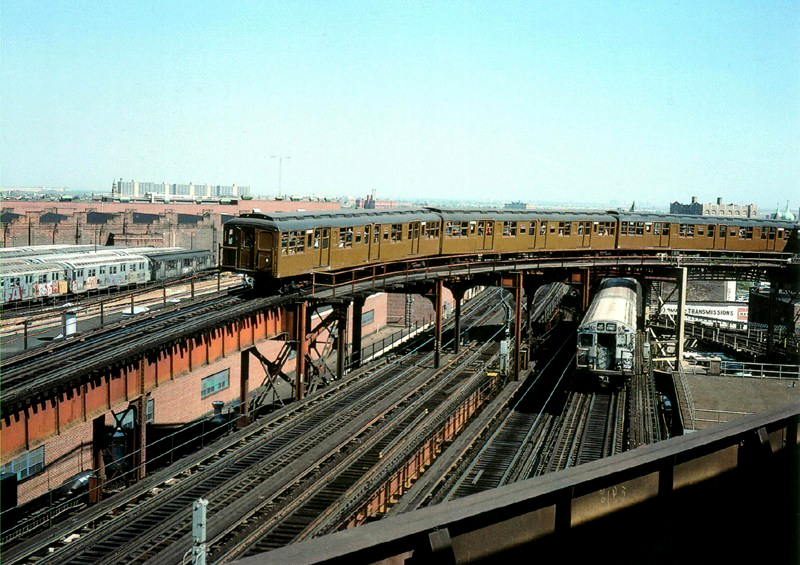 During the time of this photo, the IND was already operating the , , and trains directly below this el making the Fulton street el #13 train redundant and obsolete by 1956. A very small section of the Fulton street el survived from Rockaway Ave to Lefferts 1936 to 1956 but the train eventually took over. East of today's Euclid Ave on the train, the subway connected to the remaining Fulton street el from Grant Ave to Lefferts 1956 to the present. 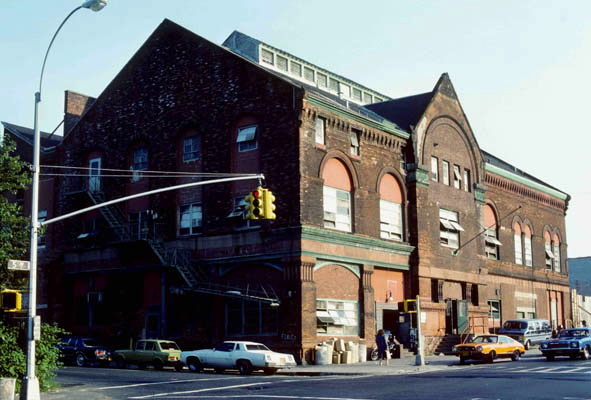 87) Which 1888 steam powered el in Brooklyn is being used for a different purpose since 1940 up until today? 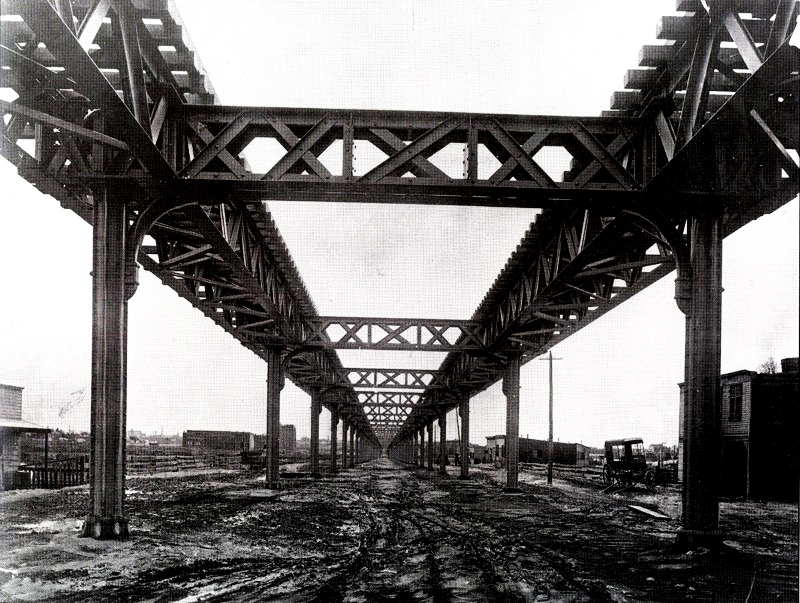 The Third Ave el has been used as a trestle for part of the Gowanus Expressway. When train service ended on June 1, 1940, the Third Ave el structure from 1893 was entirely kept from 65st/3rd Ave to 40st/3rd Ave in Brooklyn. The former Third Ave el leads the Belt Parkway and Route 278 from the Verrazano Bridge to the Brooklyn Battery Tunnel and the Brooklyn - Queens Expressway (BQE). All these years you were driving along a historical el and probably never realized it! 88) Where is the Fulton Street Transit Center? 89) Where was Park Row train station? 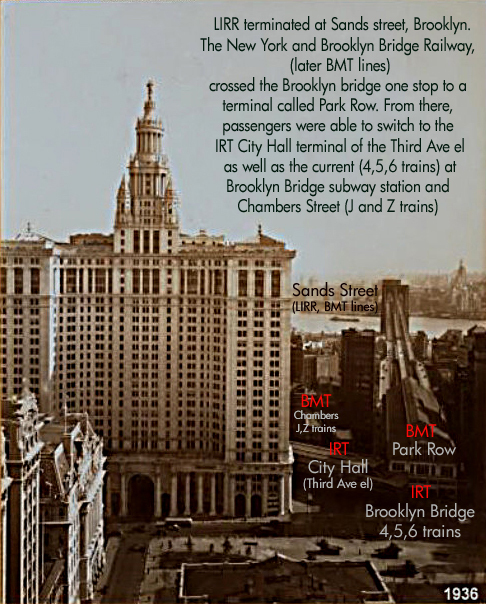 Park Row was a major elevated railway terminal in Manhattan for BMT train services operating over the Brooklyn Bridge. Until the opening of the Williamsburg and Manhattan bridges, Park Row was the ONLY Manhattan station available for elevated trains from Brooklyn. For the first decade and a half, 1883 - 1898, it was used exclusively by trains of the New York & Brooklyn Bridge Railway, a cable hauled line that spanned the length of the bridge between Park Row and another terminal on the Brooklyn side called Sands street. 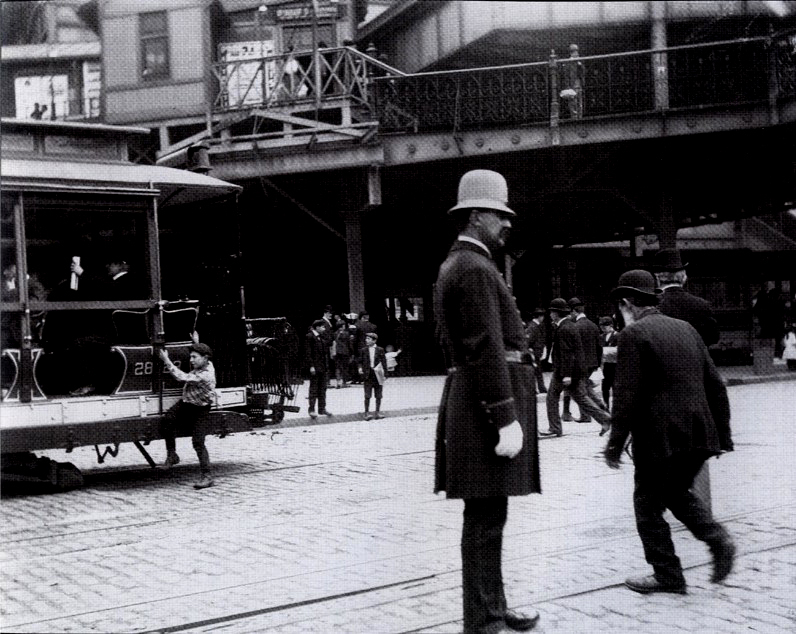 On June 18, 1898 elevated trains of predecessor companies of the BMT began using Park Row as a terminal. At the height of its success, it had 4 platforms on 4 tracks in the main part of the terminal and another 3 on two tracks west of the main train shed. 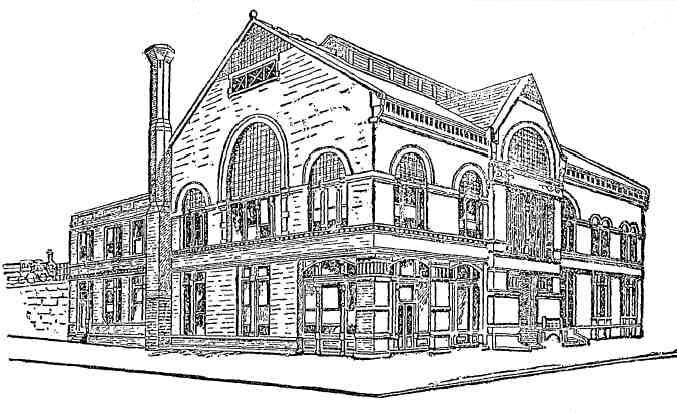 From 1898 - 1913, lines that served this terminal were the Fulton street el, Lexington el, Myrtle Ave el, Fifth Ave el (from Bay Ridge), Third Ave el (from Bay Ridge, not the Manhattan Third Ave el), and the ones still around like the Culver, West End, Brighton Beach, and Sea Beach lines. 90) What were the routes of these early lines between 1898 - 1913? 91) When was the decline of Park Row and why? 10/27/1913, last day of "older" Sea Beach service in preparation for the current Fourth Ave subway, Broadway, and Sea Beach line on 6/22/1915. 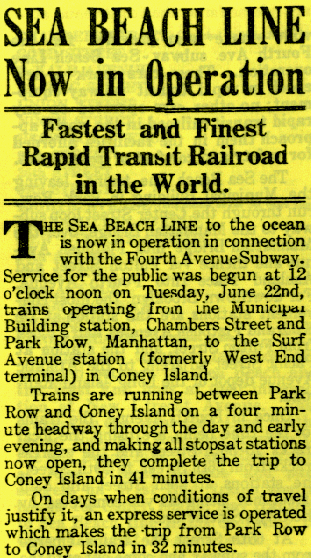 It should be noted that the "older" Park Row to Coney Island route came back very briefly along the current Sea Beach line when it was first built! This was probably to exploit the middle express tracks, (mostly neglected since 1968). Read an old newspaper article for proof. 6/24/1916, the West End el began using the Fourth Ave subway to Broadway exclusively. 92) What building is this? 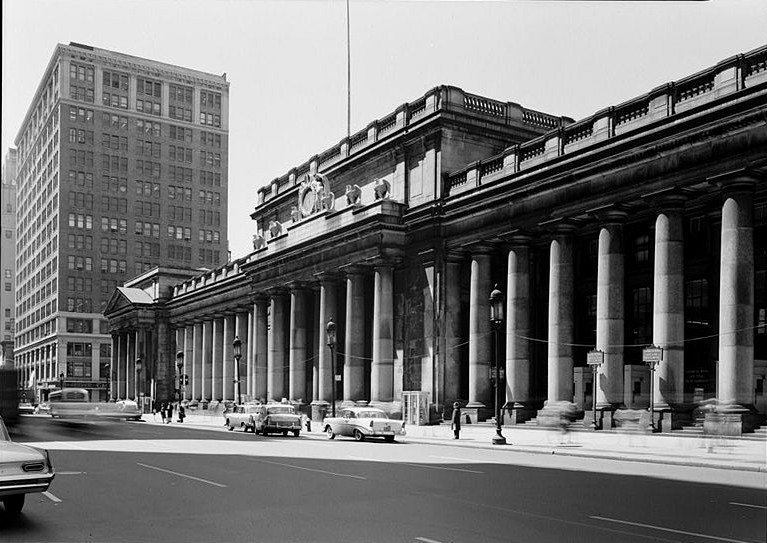 This is the 'original' Penn Station on Seventh Ave between W 31 St and W 33 St. 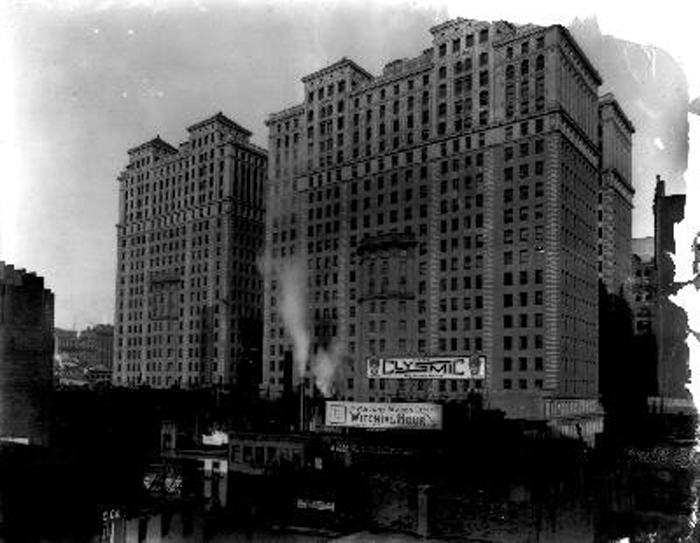 It was built in 1911 and demolished in 1966 to make way for a stupid office tower and Madison Square Garden. As it turns out, there's a Post office around the corner on 8th Ave between W 31 St and W 33 St. 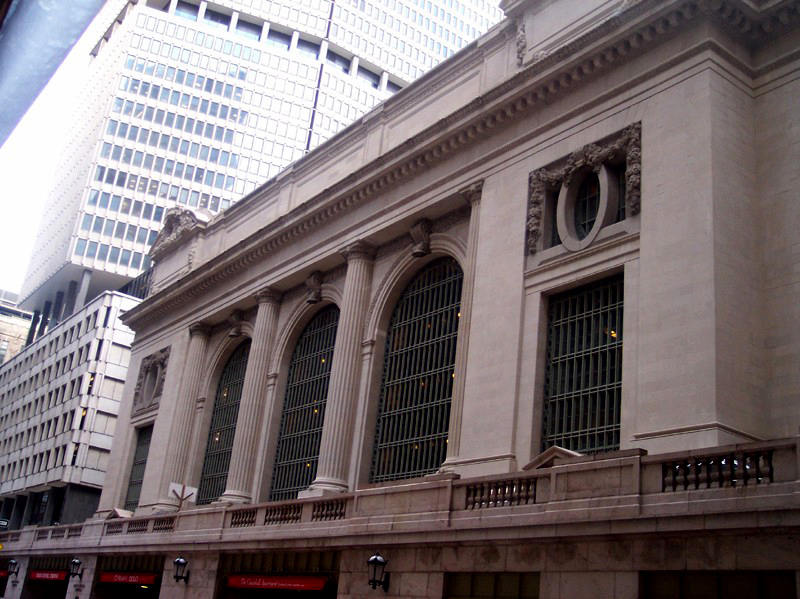 It was built around the same time as the 'original' Penn Station and looks something like it! In fact, they were built to complement each other! 93) What part of Manhattan is this known throughout the world? This is the intersection of Church and Fulton streets looking west in 1928. Above this intersection is the Sixth Ave el. The next block over in the distance is the Ninth Ave el over Greenwich Street. The IRT train is under the Ninth Ave el in the distance. In between the two els is the subway entrance to the Hudson and Manhattan Railroad company, today's PATH trains to New Jersey. Still don't know where this is? This is the very site where the twin towers once stood 1971 - 9/11/2001. All these buildings were bull-dozed to make way for the World Trade Center. Up until the 1960s, there were originally two OTHER twin towers on this property called Hudson Terminal, twenty stories each. Mixed in the background are the usual kinds of tenements and mom-pop stores you'd find elsewhere in the vicinity. In this photo is the entrance to the original north tower leading to the Hudson and Manhattan Railroad company. This system, known as the PATH today, was completed in 1911. The IRT train was in the area since 7/1/1918 and STILL blocked off since the attacks of 2001 and won't re-open to 2018. Transfers to the BMT system opened 4/14/1918, (today's , and ) and transfers to the IND didn't come until 9/10/1932, (today's train). 94) What building is this? This is a closer look at what the "original" twin towers looked like between 1911 - 1971. These "twin" towers were part of a railroad terminal called Hudson Terminal. Ironically, portions of it are still intact underground even after the attacks of 2001. 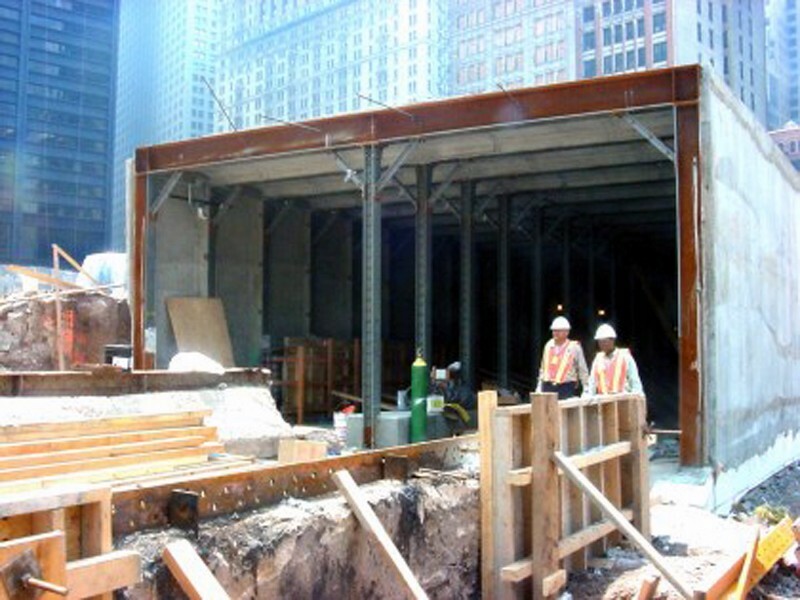 The unused portions since 1971 may be re-developed once the World Trade Center site is rebuilt in the coming years. 95) Where is this tunnel being built? This is Ground zero months after the attacks. The tunnels for the IRT and former trains were totally destroyed from 9/11 as well as the New Jersey PATH subway system in this vicinity. But notice how engineers are rebuilding it the SAME EXACT WAY as it was designed in 1900 - 1904. The style is identical to the tunnel that collapsed and opened for business 9/15/2002. Soon, this tunnel will be completely underground. While enough could never be said for the people that died that dark day and for those who suffered and continue to suffer emotionally from the human losses, the World Trade Center site will be re-developed in the coming years as a way of showing the world that we as Americans "WILL STAND STRONG!"